NEW YORK — Red Sox manager Terry Francona was peeved this morning that a (major league baseball) security person made him show that he was wearing his uniform top in the second inning of Wednesday night’s game with Derek Jeter at second base. “That was as embarrassed as I’ve been in a long time for baseball,” Francona said at his pregame press conference today. 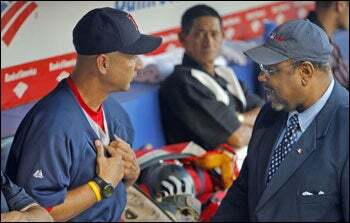 Major league baseball executive Bob Watson had asked Francona to start wearing his uniform top or at least have it on underneath a jacket or top. Francona was one of several managers who didn’t wear a jersey, but after Watson asked him to Francona has been wearing his No. 47 jersey under his top. Francona had a long chat with Watson before yesterday’s game (pictured, above). Francona was surprised the security person would insist on Francona showing it during a crucial aspect of the game. Francona said Watson first contacted him to start wearing the uniform in Cleveland in late July. Watson informed him that there was a uniform top crackdown because MLB wanted their managers to respect the game and wear the proper attire. When I asked MLB about this a few weeks back, they told me that as long as the manager wears an approved top with the team’s logo on it, it’s OK. But since then MLB has decided that wearing the uniform is important. Francona was also upset that his pregame discussion with Watson, which apparently didn’t dwell too much on the uniform issue, was characterized as contentious in one newspaper report in New York. Francona and Watson have been at odds in the past, but over the past two years they have enjoyed a revived friendship. After complying, Francona was surprised that the security person would step in. “The timing to me was incredible,” Francona said. “He made me show him. I thought Jeter was going to steal third.” Francona said that the exchange caused him to miss one pitch. Francona said that he hadn’t been fined yet but was concerned that substantial fines would mount if he didn’t comply. So he did. Francona said he had personal reasons for not wearing the uniform top in the past and most have to do with his circulation problems and the layers of clothes he wears. He also doesn’t like to be restricted and have things tucked in, he says. Francona said he had no complaints with Watson, who he described as “very nice about it” but remained furious over the timing and the interruption of his managing during the game.